St. Bernard of Clairvaux Church Bella Vista Contact the parish office at (479) 855-9069 for more information. Our Lady of Fatima Church Benton Call Taffy Council at (501) 580-9501 for more information. St. Joseph Church Conway Contact church office at (501) 327-6568 for more information. St. Joseph Church Fayetteville Contact Rosa Maria Diaz at (479) 502-8564 for more information. St. Boniface Church Fort Smith The chapel is located on the west end of the church office. For more information, contact Rudy and Dorothy Gramlich at (479) 452-7595 or John and Joyce Becker at (479) 783-8569. Christ the King Church Little Rock Call Alison Nicholas at (501) 225-6774 for more information. St. Peter the Fisherman Church Mountain Home Contact Angela Degroote at (870) 481-5969 for more information. St. Paul the Apostle Church Pocahontas Contact Judy Wurtz at (870) 892-3598 for more information. St. Mary Church Altus 8 a.m.
St. Mary Church Batesville 10 - 10:30 a.m., 12 - 12:30 p.m.
St. Boniface Church Bigelow 7 - 8 a.m.
St. Louis Church Camden 8 a.m.
St. Jude Thaddeus Church Clinton First Sun. 9:45 - 10:45 a.m.
St. Francis of Assisi Church Fairfield Bay 8:15 - 8:45 a.m.
Mary Mother of God Church Harrison 7 a.m. - 7 p.m.
St. Mark Church Monticello 8 - 8:45 a.m.
Immaculate Conception Church North Little Rock Begins at 6 p.m.
St. Mary Church Siloam Springs 3:30 - 7 p.m.
St. Peter Church Wynne 8:25 - 8:55 a.m.
St. Michael Church Cherokee Village 10 a.m. - 10 p.m.
Holy Redeemer Church El Dorado 6 - 7 p.m. Blessed John Newman University Parish Jonesboro 7:30 a.m. - 5:30 p.m. Blessed Sacrament Church Jonesboro 7:30 a.m. - 5:30 p.m.
St. Edward Church Little Rock 6 a.m. - 9 p.m.
St. Elizabeth Church Oppelo 6:30 a.m.
St. Mary Church Arkadelphia 5 - 5:45 p.m.
Immaculate Conception Church Blytheville 5 - 6 p.m.
St. Elizabeth of Hungary Church Eureka Springs 5 p.m.
Our Lady of Good Hope Church Hope 8:30 - 9 a.m.
Immaculate Heart of Mary Church Magnolia 4 p.m.
St. Joseph Church Paris 6:30 - 7:30 p.m.
St. Joseph Church Pine Bluff 7 a.m. - 9 p.m.
St. Mary Church Siloam Springs 12:30 - 7 p.m.
Immaculate Heart of Mary Church Walnut Ridge 5 - 5:30 p.m.
St. Anne Church Berryville 5 - 6 p.m.
St. Augustine Church Dardanelle 6 - 7 p.m.
Sts. 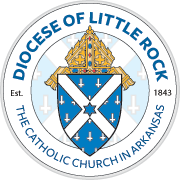 Sabina and Mary Church Jenny Lind 6:30 - 7:30 p.m.
Cathedral of St. Andrew Little Rock 7 - 11 a.m.
Our Lady of the Holy Souls Church Little Rock 9 a.m. - 5:15 p.m.
St. Agnes Church Mena 8 a.m. - 5:15 p.m.
Sacred Heart Church Morrilton 10 a.m. - 10 p.m.
St. Cecilia Church Newport 5:30 - 6 p.m.
Immaculate Heart of Mary Church North Little Rock 1 p.m. - 9 p.m.
St. Mary Church North Little Rock 2 - 8 p.m.
St. Joseph Church Pine Bluff 8 a.m. - 9 p.m.
St. James Church Searcy 40-hour adoration begins 8 p.m. before first Fri. and ends at 11:45 a.m. first Fri.
St. Michael Church Van Buren 8:30 a.m. - 5 p.m.
St. Mary Church Arkadelphia 6 - 6:45 p.m.
St. Andrew Church Danville 6 - 7 p.m.
St. Barbara Church De Queen 7 p.m.
Holy Redeemer Church El Dorado 7 - 8 p.m.
St. Albert Church Heber Springs 7:45 a.m.
Our Lady of Good Hope Church Hope 6:30 - 7 p.m.
All Saints Church Mount Ida 9 - 10 a.m.
St. Joseph Church Pine Bluff 7 a.m. - 6 p.m.
St. Mary Church Siloam Springs 1 - 7 p.m.
Sts. Cyril and Methodius Church Slovak 5 p.m. - 6 p.m.
Our Lady of Good Counsel Church Little Rock 8:30 a.m. - 9 p.m.
St. Theresa Church Little Rock 9:30 a.m. - 6:45 p.m.
St. Joseph Church Pine Bluff 7 a.m. - 4 p.m.
St. James Church Searcy 11 - 11:45 a.m.
St. Joseph Church Tontitown Ends 7:30 a.m.
St. Peter Church Wynne 7:25 - 7:55 a.m.
St. Mary Church Altus 4 p.m.
Immaculate Conception Church North Little Rock Ends at 4 p.m.
St. Mary Church Saint Vincent First. Sat. 8:30 - 9:30 a.m.
St. Benedict Church Subiaco Ends 8 a.m.
St. Michael Church Van Buren 3 - 4 p.m.
Immaculate Heart of Mary Church Walnut Ridge 3:30 - 4 p.m.
St. Michael Church West Memphis 4 - 4:45 p.m.